Today, Africa is considered to be the cradle of human ancestry, from which we may all trace our descent. Based on the evidence to date, most scientists concur that humankind evolved and modern humans emerged on the African continent. Recent discoveries of cultural artifacts dating back 70,000 years also suggest that the earliest forms of visual expression may be found in Africa. For many thousands of years, Africans have contributed to the cultural heritage of the world, creating masterful works of astonishing innovation and creativity. Today, over 680 million people live in Africa. Although some regions remain sparsely inhabited, others are densely populated. The West African nation of Nigeria, for example, has one-fifth of the entire continent’s population. About a third of all Africans live in large cities such as Lagos (Nigeria), the continent’s most populous city with 13.5 million people. Other major urban centers in contemporary Africa include Cairo (Egypt), Kinshasa (Democratic Republic of Congo), Abidjan (Côte d’Ivoire), Dakar (Senegal), and Johannesburg, Cape Town, and Pretoria (South Africa). The majority of Africans, however, live in more rural areas where their lifestyle centers on agricultural activities. 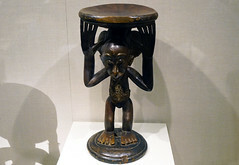 In those parts of the continent that are not heavily urbanized, Africa’s geography and climate have especially impacted the development of different artistic traditions. In agricultural communities, seasonal patterns of rainfall and drought affect cultivation and, by extension, their cultural practices. An alternation between rainy and dry seasons is seen throughout much of Africa, in varying degrees. 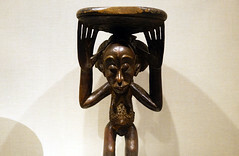 Dry seasons allow opportunities for part-time artisans to create artifacts and for people to organize festivals and other large-scale social events that employ such art forms. Certain areas, such as southwestern Africa and parts of eastern Africa’s interior, also had (and continue to have) frequent droughts. 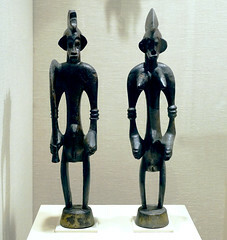 This has forced populations to migrate often or adopt a nomadic lifestyle. As a result, their artistic expression has focused on relatively ephemeral and personal traditions such as body ornamentation, rather than larger scale wooden sculpture. Throughout the continent, there is found a diversity of societies, languages, and cultures. It is estimated that there are well over 1,000 distinct languages in Africa, making it the most linguistically varied of all the continents. In Nigeria alone, more than 250 different languages are spoken. Important regional languages, spoken over broad geographic areas by people of varied ethnicity, include Arabic in northern Africa, Swahili in eastern Africa, and Hausa and Mandinka in parts of western Africa. English, French, and Portuguese were introduced during the colonial period and remain in wide usage today. Culturally, Africans define themselves in many different ways: by occupational caste, village, kinship group, regional origin, and nationality. 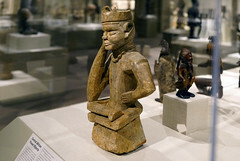 “Peoples” or “cultures” are the preferred terms when referring to ethnic identities; “tribe”—a word sometimes applied to African peoples or societies—is an inappropriate, even inaccurate term, and should be avoided. Based on a concept developed by nineteenth-century Western social theorists, “tribe” was used to describe a group of people sharing a common language, history, geographic region, and sociopolitical organization. In reality, ethnicity and social identity are much more complex, as Africans may identify themselves in multiple ways. For example, an individual may be simultaneously Nigerian, a resident of the Delta State, Ijo (a broad ethnic designation), and Kalabari (an eastern subgroup of the Ijo). Furthermore, the term “tribe” reflects misleading historical and cultural assumptions, as it often implies a kind of cultural backwardness with derogatory associations. Cite this page as: Dr. Christa Clarke, "Peoples and cultures," in Smarthistory, September 21, 2016, accessed April 24, 2019, https://smarthistory.org/peoples-and-cultures/.